marraskuu | 2014 | Rooman Klubin Suomen yhdistys ry. 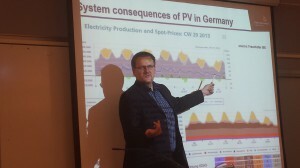 On Monday, November 3 2014, FICOR held an event in Helsinki with professor Christian Breyer titled ”Are there real limits to growth in the ’Neo-Carbon Energy’ world?”. Professor Breyer explained the Neo-Carbon Energy concept and the way of thinking behind it and its relationship with Limits to Growth. Later it was discussed whether with almost limitless solar and wind energy humanity can push itself past the limits or not. Julkaistu 5.11.2014 kategoriassa Yleinen, kirjoittanut admin_roksy.